proven method and build your reputation. Welcome to Get Ripped!® Instructor Training! We are so excited to reveal our new training platform! The purpose of this training program is to provide personal fitness trainers with an innovative, comprehensive training system to help our clients achieve and surpass their fitness goals. Get RIPPED!® is the critically acclaimed and best selling total body workout system designed to maximize fat loss, burn calories and sculpt lean muscle. Created by certified personal trainer and fitness expert, Jari Love, in collaboration with a team of exercise physiologists and physiotherapists, this high-rep, low weight workout program has been clinically proven to burn up to three times the calories of a traditional weight training program. Accessible, modifiable, progressive and fun, each of the five phases of Get RIPPED!® has been scientifically designed and evaluated, featuring only the safest and most effective lab-tested exercises. Get RIPPED!® classes can be used as a standalone wellness/transformative methodology or as part of a broader protocol. 96-1 is a first level of the COMPOUND PHASE of Jari Love’s 5-Phase Get RIPPED! certification courses. Featuring compound exercises, 96-1 will help participants blast out of plateaus with this easy to follow and effective workout that maximizes exercise time. The workout follows a consistent pattern of 6 sets of 16 reps for each exercise with an 8-count recovery in between each set. These double duty exercises burn tons of calories while elevating the heart rate and sculpting lean muscle. Get RIPPED!® 96-2 is a compound phase which is a part 2 of the 96 certification courses. It teaches more advanced, next step up exercises from the original Get RIPPED! 96-1 Foundation course. Each workout track combines two different compound exercises for double duty burn. This is the last phase of a 3-part 96 certification program. The Endurance course reaches new levels in Jari Love’s latest workout, Get RIPPED!® 96-3. The high-repetition compound exercises featured in both Get RIPPED! 96-1 and 96-2 are combined with active recovery and minimum rest between sets to make 96-3 a total body workout guaranteed to maximize fat loss, rev up the heart rate, sculpt the body and build endurance. This high energy workout has been proven to help our clients lose weight and keep them coming back for more. The new program is backed by science just like RIDE. Both programs use cardio zone training to insure that clients are safe. This also allows you to track their progress throughout. You will learn the science behind our comprehensive cycling program. We give you the skills to be able to apply them to your own classes. Wouldn’t you like to tell your clients the science behind their weight loss journey? We have done the research for you! Learn how this program is scientifically proven to help people transform their bodies. What is the Get RIPPED!® program? Get RIPPED!® is the critically acclaimed and best selling total body workout system designed to maximize fat loss, burn calories and sculpt lean muscle. Created by certified personal trainer and fitness expert, Jari Love, in collaboration with a team of exercise physiologists and physiotherapists, this high-rep, low weight work-out program has been clinically proven to burn up to three times the calories of a traditional weight training program. Accessible, modifiable, progressive and fun, each of the five phases of Get RIPPED!® has been scientifically designed and evaluated, featuring only the safest and most effective lab-tested exercises. With a focus on compound exercises, the Get RIPPED!® program incorporates free weights, weight bars, athletic steps and plyometric training. How do I become a Get RIPPED!® certified Instructor? What is included in the Get RIPPED!® Instructor Certification program? When you purchase the Get RIPPED! 96-1 foundation course you will receive instructional videos, manuals and Love Notes. After you submit your video and pass the course, you will receive a Certificate of Completion. You can submit the Certificate of Completion to Canfitpro, AFLCA, AFAA, or NASM to receive Continuing Education Credits (CECs). Upon completing your purchase, you’ll be emailed your receipt and instructions on how to access your member only material. Can this program be used on my computer, iPad, Android tablet, etc? The training videos are streamed and accessible from any device that has internet access. The downloaded material is best accessed from a desktop, laptop, or tablet that allows you to save onto the hard drive. Once I purchase the certification program, how do I get my Get RIPPED! certificate? After learning the material from Get RIPPED! 96-1, you are required to send a video of yourself teaching songs #3 and #6. Once received, our team will evaluate you based on your form, exercise explanations, and the overall instructing experience. Once you have completed your course on Dynactive, there is a box for you to insert a link to your video for it to be evaluated and graded. Videos may be uploaded to Dropbox or Google Drive. Note: It is highly recommended, but not mandatory that you have either Canfitpro, AFAA, ACE or any other recognized fitness instructor training certification. Having those accreditations will help you learn the material much easier. No. You will be evaluated based on your video submission. To get certified, can I choose two songs from a different add-on? No, Get RIPPED! 96-1 is the foundation course and teaches you all the components required to become certified. Is the music included in each add-on and in the certification? No, it is not included. You may purchase the music from here www.musclemixes.com. Where do I buy the Get RIPPED! music? You may purchase the music at www.musclemixes.com. These are instrumental music tracks that include voice cues and sound effects to help you know where you are in the music. This helps you to stay on the beat and start on the right phrase. The music is only $4.95 and it is strongly recommended since it will help you learn how to teach each add-on more effectively. Does the evaluation have to be in front of a group or on my own? You can choose which one you want to allow you to have your best performance. When you pass your evaluation, the certificate will be mailed to you. Once our team has evaluated your video, you will be able to view your mark and feedback through your Dynactive account. Our goal is to help you succeed, so you can resubmit your video up until the expiration date. We will provide you with tips on what to work on and areas of improvement for your next video submission. How do I get the CECs? Once you have passed the video submission and received your certificate of completion, you send a copy of your certification to Canfitpro, AFLCA, AFAA, or NASM to receive the credits. How long does my certification last for? Your certificate will expire one year from the date you are certified. When your certification is about to expire, you will receive an email reminding you to pay the renewal fee of $99. You will be required to submit a video with the new songs you have chosen to become recertified. Once you have passed, you can send a copy of your certificate to obtain your CECs. Can I use the certification to teach small group exercise classes? Yes, not only that but you can use the Get RIPPED! name for your boot camp classes and private training. The Get RIPPED! brand is recognized and registered in Canada and the USA. Love Notes are video tips on educational content to help you as instructor to effectively teach your participants that attend your fitness classes. You will gain access to Love Notes when you purchase the certification package and individual add-ons. What is a Get RIPPED! add-on? A Get RIPPED! 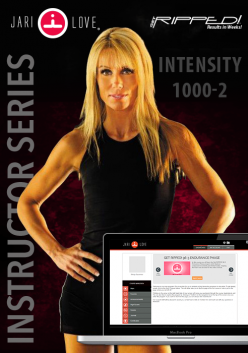 add-on is additional instructional packages to help you teach a Get RIPPED! class. Add-ons do not certify you to become a Get RIPPED! instructor. Each add-on comes with videos, program manuals, and Love Notes. The corresponding music will have to be purchased from musclemixes.com. There are no ongoing monthly fees, the add-on will expire one year after purchase. Do I need to be a certified Get RIPPED! instructor to purchase single add-ons? What do I do when the classes are only 30 to 45 minutes long? You have the flexibility to pick and choose song tracks to equal the class time. Can I use the Get RIPPED! logo or the names of the add-ons? The Get RIPPED! logo is a registered trademark in Canada and in the United States. You will have to be certified in order to use the Get RIPPED! name. Once you are certified, you can use Get RIPPED! in the Canada and the United States. Can I share the material? No. As part of a Get Ripped, Inc. (“GRI”) Instructor Certification and/or Instructor Training Program (“the Program”), you will be supplied by GRI and/or its agents certain information that GRI deems confidential and that constitutes GRI’s confidential, proprietary information (“Confidential Information”). As a condition of receiving the Confidential Information from GRI, you will agree to keep such information strictly confidential and not to directly or indirectly copy, reproduce, disseminate, disclose or exploit said information, or to cause any third parties to do so, in whole or in part, in any manner, form, or media now known or hereinafter devised, throughout the world. This includes all your materials, streamed videos, downloadable manuals, and Love Notes.